Today’s military innovators are the modern-day scientists and engineers who assist in the creation of contemporary and new concept weaponry; and the military theorists who study changes in the character of war. Digital specialists understand how to develop and employ the capabilities of electronic warfare equipment, satellite technology, and fiber optic cables. While Kalashnikov’s fame is imbedded in Russia’s culture, it may be harder to find a current digital entrepreneur whose legacy will endure as long as his: there are simply too many of them, and their time in the spotlight appears to be quite short, since even now we are about to pass from the age of cyber to that of quantum. It is difficult to predict whose discoveries will be the most coveted by tomorrow’s military-industrial complex, not to mention the decision-making apparatus of the Kremlin and General Staff. Military theorists are playing an important role as well. They are studying how new weaponry has changed the correlation of forces in the world, the nature of war, and the impact of weaponry on both forecasting and the initial period of war. 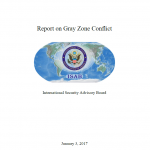 The study addresses the challenges facing the United States from the increasing use by rivals and adversaries – state and non-state alike – of what have come to be called “Gray Zone” techniques. 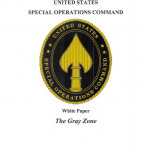 The term Gray Zone (“GZ”) denotes the use of techniques to achieve a nation’s goals and frustrate those of its rivals by employing instruments of power – often asymmetric and ambiguous in character – that are not direct use of acknowledged regular military forces. 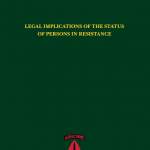 The purpose of this study is to provide a synthesis of the prevailing issues and analysis concerning the legal status of persons in resistance. This document refers broadly to resistance and those involved in it, meaning those individuals comprising the resistance element, US personnel supporting or countering the resistance, and the standing government. In alignment with this focus, the document explores the status of personnel particularly in foreign internal defense (FID), counterinsurgency (COIN), and unconventional warfare (UW) operations. When originally conceived, this manuscript was to be an updated volume of the 1961 American University Special Operations Research Office (SORO) study, The Legal Status of Participants in Unconventional Warfare. The National Security Analysis Department (NSAD) of the Johns Hopkins University Applied Physics Laboratory (JHU/APL) was asked by the US Army Special Operations Command (USASOC), G-3X Special Programs Division, to review and analyze the historical use of international law, the law of land warfare, and applicable international conventions and update the SORO study accordingly and also include unique legal considerations regarding the status of irregular forces. Because many aspects of both law and policy have changed since the 1961 publication, particularly within the context of US involvement in Afghanistan and Iraq, USASOC requested that this manuscript be a new document to account for these changes, highlight key legal questions, and position these questions within the context of hypothetical scenarios and historical examples. 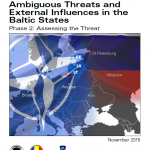 Russia’s strategic objectives in the Baltic region do not focus on the Baltic States as final targets, but on using the Batlic States to discredit and dismantle the North Atlantic Treaty Organization (NATO) and undermining the European Union (EU) by using the Baltic States. 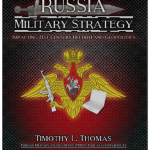 Experts in Russia and European security from the United States and the Baltic region agree that Russia could use the Baltic States toward this end by employing any one of a spectrum of actions, to include direct invasion with conventional forces, an incursion and occupation using irregular forces like the one witnessed in Crimea in 2014, or longterm fostering of social, political, and economic instability. Disagreement existed among experts as to which approach was more likely. 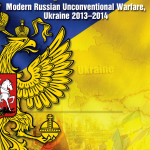 This document is intended as a primer—a brief, informative treatment—concerning the ongoing conflict in Ukraine. It is an unclassified expansion of an earlier classified version that drew from numerous classified and unclassified sources, including key US Department of State diplomatic cables. For this version, the authors drew from open source articles, journals, and books. Because the primer examines a very recent conflict, it does not reflect a comprehensive historiography, nor does it achieve in-depth analysis. Instead, it is intended to acquaint the reader with the essential background to and course of the Russian intervention in Ukraine from the onset of the crisis in late 2013 through the end of 2014. This guide is a quick reference of Unconventional Warfare (UW) theory, principles, and tactics, techniques and procedures. It is not a complete treatment of the subject. To guide further study, it includes (in annotated form) as many references as possible starting with established law, policy and doctrine, includes scientific studies, and finishes with recommended reading on the subject. 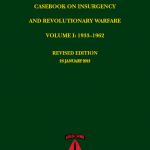 The Assessing Revolutionary and Insurgent Strategies (ARIS) series consists of a set of case studies and research conducted for the US Army Special Operations Command by the National Security Analysis Department of The Johns Hopkins University Applied Physics Laboratory. The purpose of the ARIS series is to produce a collection of academically rigorous yet operationally relevant research materials to develop and illustrate a common understanding of insurgency and revolution. This research, intended to form a bedrock body of knowledge for members of the Special Forces, will allow users to distill vast amounts of material from a wide array of campaigns and extract relevant lessons, thereby enabling the development of future doctrine, professional education, and training. 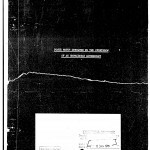 A CIA “hypothetical case history describing the power plays or pressures required to overthrow an unfriendly government” that was released as part of a collection of documents related to the 1954 coup in Guatemala. During the last decade, the U.S. military, along with its interagency and international partners, has generated significant capability to counter the irregular threats presented by non-state terrorists, insurgents, and criminal groups. During these same years, a distinct challenge to America and its partners in NATO and beyond has arisen through an innovative mix of such irregular threats. This challenge is Hybrid Warfare combining conventional, irregular, and asymmetric means, to include the persistent manipulation of political and ideological conflict. Foreshadowed by Iranian actions throughout the Middle East and by Chinese “unrestricted warfare” strategists in the 1990s, Hybrid Warfare has now reached its most brazen form in Russia’s support for separatist insurgents in Ukraine. 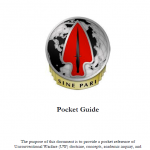 This manual provides commanders and staffs of brigade elements and below with concepts and doctrine concerning the conduct of counterguerrilla operations by US forces in insurgency and conventional conflict environments. It provides a general overview of US counterinsurgency strategy and the impact that strategy has on counterguerrilla operations. It provides planning, training, and operational guidance for commanders and staffs conducting counterguerrilla operations. The doctrine provides principles to guide the actions of US forces conducting counterguerrilla operations. In applying these principles, the commander must be aware that the situation in each counterguerrilla operation is unique. Techniques and tactics applied successfully in one situation may not be suitable if applied in the same manner in another situation. The principles in this manual are guides to be adapted to each counterguerrilla situation. The intent of U.S. UW efforts is to exploit a hostile power’s political, military, economic, and psychological vulnerabilities by developing and sustaining resistance forces to accomplish U.S. strategic objectives. Historically, the military concept for the employment of UW was primarily in support of resistance movements during general-war scenarios. While this concept remains valid, the operational environment since the end of World War II has increasingly required U.S. forces to conduct UW in scenarios short of general war (limited war). Enabling a resistance movement or insurgency entails the development of an underground and guerrilla forces, as well as supporting auxiliaries for each of these elements. Resistance movements or insurgencies always have an underground element. The armed component of these groups is the guerrilla force and is only present if the resistance transitions to conflict. The combined effects of two interrelated lines of effort largely generate the end result of a UW campaign. The efforts are armed conflict and subversion. Forces conduct armed conflict, normally in the form of guerrilla warfare, against the security apparatus of the host nation (HN) or occupying military. Conflict also includes operations that attack and degrade enemy morale, organizational cohesion, and operational effectiveness and separate the enemy from the population. Over time, these attacks degrade the ability of the HN or occupying military to project military power and exert control over the population. Subversion undermines the power of the government or occupying element by portraying it as incapable of effective governance to the population.